Another super week here at Cloud 66. 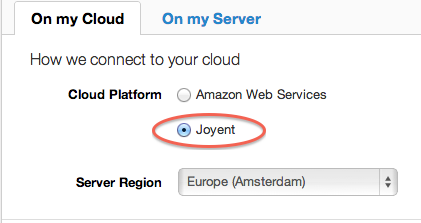 We are excited to announce the now Cloud 66 supports Joyent Cloud alongside AWS. Joyent is a leader in public and private cloud with their Smart Data Center and SmartOS offerings. With Cloud 66 deploying your Ruby on Rails apps to Joyent Cloud is now as simple as selecting Joyent from the Cloud provider drop down. You can also choose which data centre you would like to deploy your app to. Currently Joyent has data centres in US East, US West and Southwest as well as Europe (Amsterdam) and we support all of them.